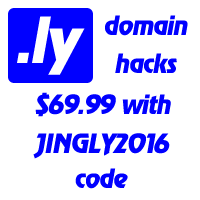 This weblog is dedicated to Libyan domain names and is run by the partners of Brands-and-Jingles, whose team gathers and discusses news about .LY, .ME and other jingling domains. At Brands-and-Jingles, we believe that these jingling country code top-level domains (ccTLDs) have bright prospectives and will shift few online paradigms as well as impact offline marketing and advertising. This blog provide you up-to-date industry overviews, trends and in depth analysis of top .LY domains. Should you have any queries regarding this web site or domaining industry, our consultants will be glad to answer your questions. Please send us your message using this form. Brands-and-Jingles team members will make sure you receive your advice as soon as possible.